This week’s guest post comes to us from Sarah Warburton, who previously brought us the hand-knitted Tardis socks. She’s been at it again, this time incorporating poetry into her clothes. I’m totally stealing this idea, just as soon as she teaches me how to do it myself! 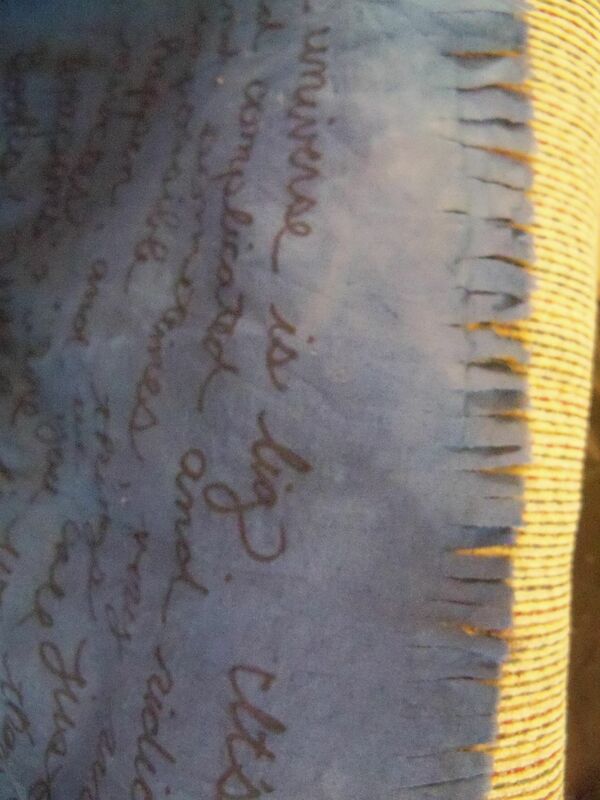 While I was putting together a swap package for a Joss Whedon swap, I became obsessed with the idea of making a scarf with writing on it. I found some very pretty ones on Etsy with a single quote at one end and how-to’s on the internet for ones with extremely thick lettering done horizontally, but I had something else in mind. Here’s what I put together. 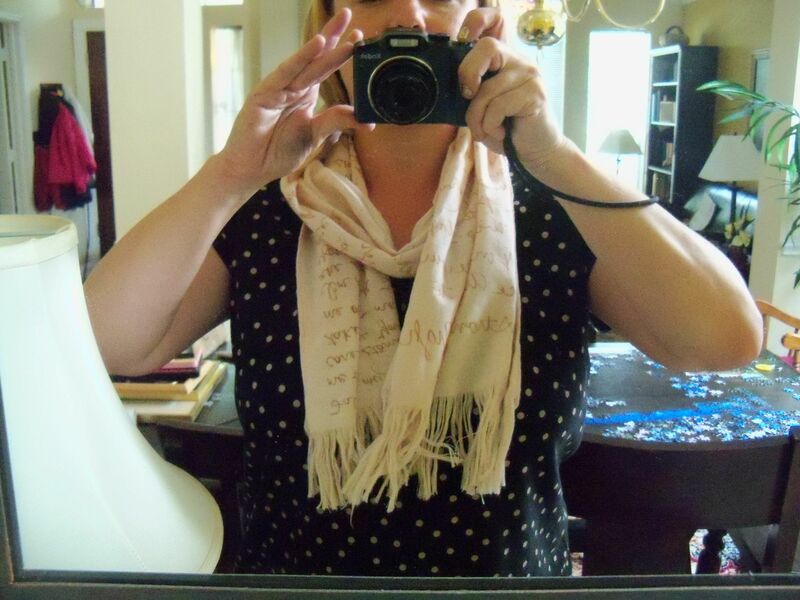 Since I live in Texas, I knew I wanted to go with a linen scarf. I like that linen gets softer and softer the more you wear and wash it, that it’s very strong and durable, and that it allows excellent air flow. As a Classics major, I also have a soft spot for linen, since the flax plant is one of the oldest plants found in Egypt, Greece, and ancient Rome, and linen’s been around for ages. Also, when I walk the kids to school, I like to have something not too hot to keep the sun off my neck. Linen’s just perfect. Would it be easier to just buy a scarf and write on it? Of course. But part of the fun of a swap is stretching your dollars and putting time and creativity into a craft. 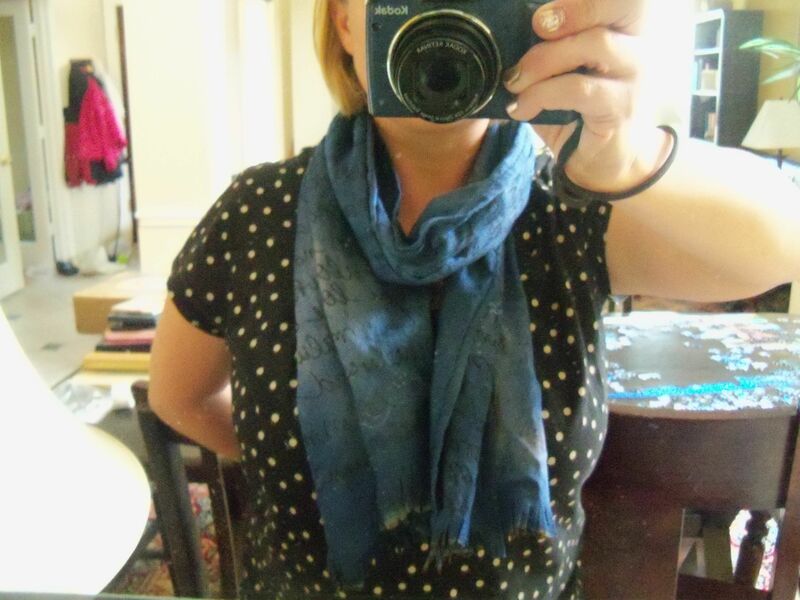 I did look at some commercially-available scarves to get a sense of the measurements I’d need. 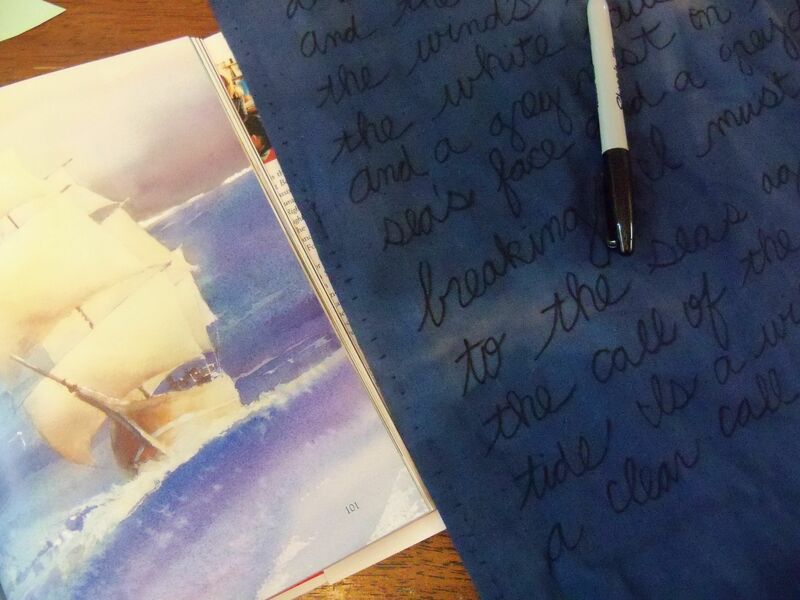 For the first project, I bought two yards of natural linen at the width found on the bolt at Joann’s. I dyed this with black tea and fruit punch Kool-aid (no sugar added!). This is where I learned that black tea is not a very effective dye for plant-based fabrics, but ultimately I did get the pinkish sepia color I wanted. 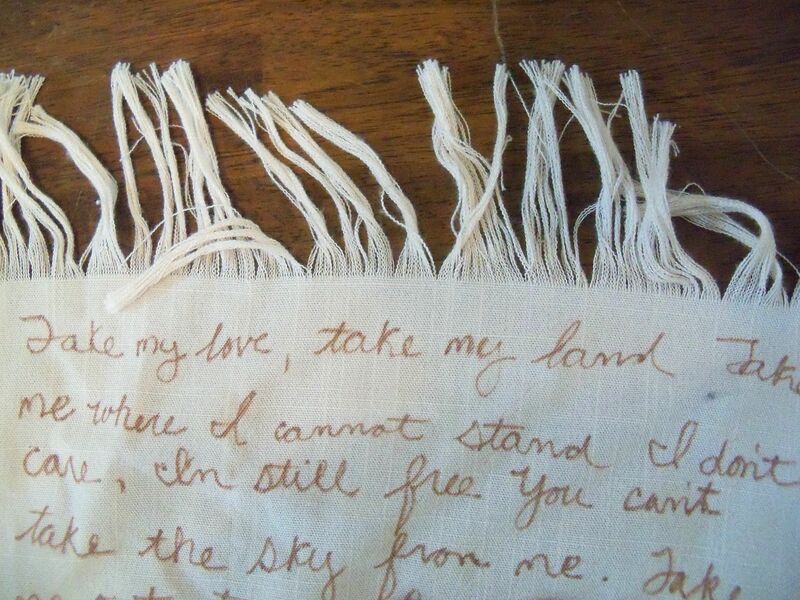 For the second project, I used i-dye fabric dye specifically for linen (and cotton and hemp, etc). In both cases, I used an old pasta pot I use only for dyeing and boiled the fabric on the stove. Feel free to simply follow the directions on the packet…if you’re brave enough to use your washer. I wasn’t. 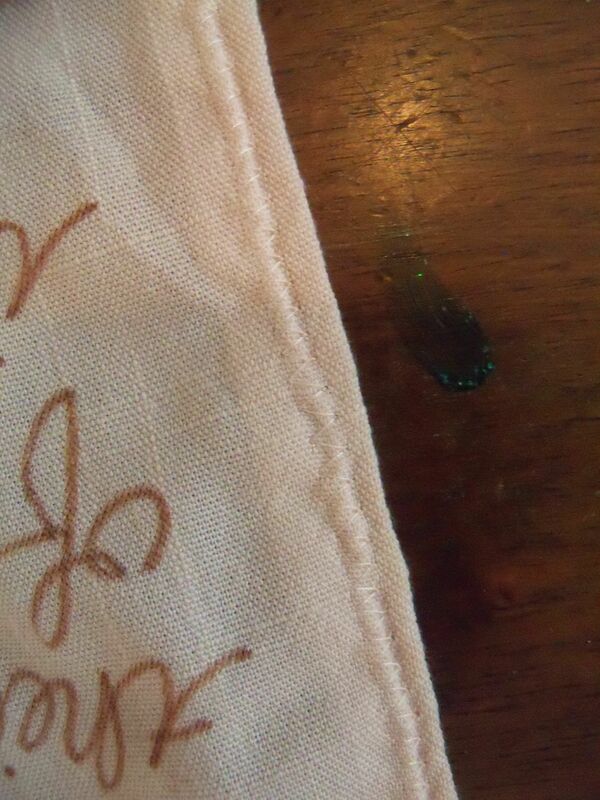 Once I had the color I wanted, I let the fabric drip dry. Taking a tip from the nice woman at the Joann’s counter, I divided the scarf into three strips by measuring, then tearing the length of the fabric. She was right, it made nice straight lines (a word the etymology of which leads right back to the Latin linum). Now for the short edges of the scarf. For the first round I made a fringe by removing the weft or the short pieces of the threads of the fabric, leaving the only the long pieces for those last two inches. The pros of this method are that it makes a thick, silky fringe…and it’s fun to pull out bits of the fabric. The con would be that it’s extremely time-consuming to pick out and remove so many fine threads (and your family members may complain if they find bits of thread lying around). For the second round of scarves I cut a thick fringe. It’s much faster and is a different look. I do wonder how it will wear over the long haul. Now the fun part! Originally I bought fabric markers, but through trial and error I found I got a finer point and smoother lines with a Sharpie. And since I’m still washing shirts for my six-year-old with my nine-year-old son’s name permanent markered onto them, I was confident they’d hold up. For the first round of scarves I used a dark brown Sharpie. 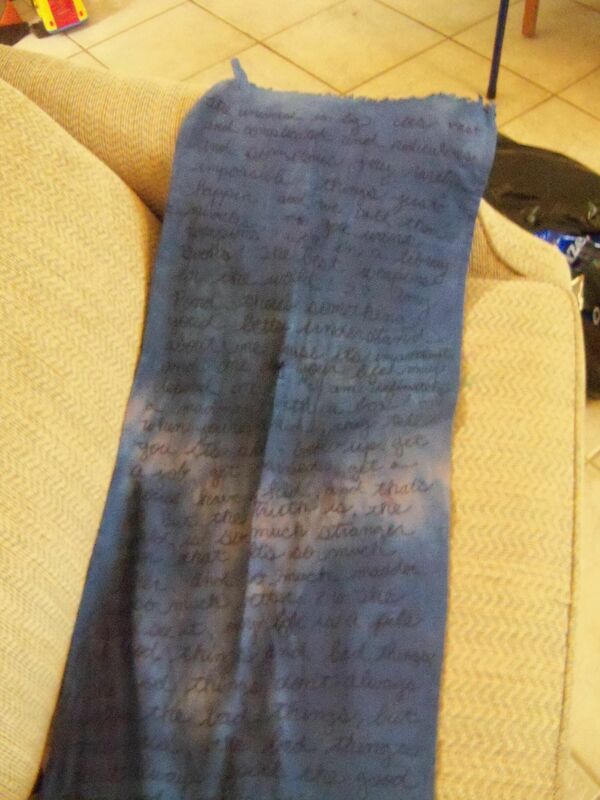 For my own scarf and my swap scarf, I inscribed Joss Whedon quotes. My mother requested “Be Thou My Vision” on hers. There’s no right or wrong way to do this part, but I chose to do a slow cursive, separating the words, and writing horizontally. For the blue scarves, I used a black sharpie and inscribed one scarf with e.e.cummings’ “maggie and milly and molly and may” for my sister, one for my swap partner with Doctor Who quotes, and another for myself with “maggie and milly and molly and may” and also “Sea Fever” by John Masefield. As a writer, I love wearing text, knowing that only bits of it are legible to others. It’s meaningful, decorative, and also a bit of secret. If you’d like to be a contributor to our Fashion Friday series, click on this page to find out how. Okay, that’s just an awesome project. And so beautiful My first thought was these would be great gifts to friends if you wrote down some of the stories of your escapades together, or what they mean to you or what you love about them. What a great idea! 🙂 I’d been thinking of finding poems or songs which are meaningful to my relationship with that person, but anecdotes would be cool, too. I love this idea! And thank you so much for including the instructions. By sheer coincidence, one of the top three on Project Runway last week had written a love letter to his husband and sons on the dress he made. I think it was linen as well and was simply gorgeous. wasn’t that a beautiful dress? Hands-down my favorite piece last week!